Hi, This is an officially approved new update of Yu Yureka. And here is an easy and safe guide to Install Official Marshmallow Yu OS for Yu Yureka. Step 1: Download and install Yu Yureka USB driver on your PC and enable USB debugging mode on your Yu Yureka Smartphone by this guide in developer option . Now download and extract Fast-boot tool then extract Marshmallow Yu OS in the Fast-boot tool folder. 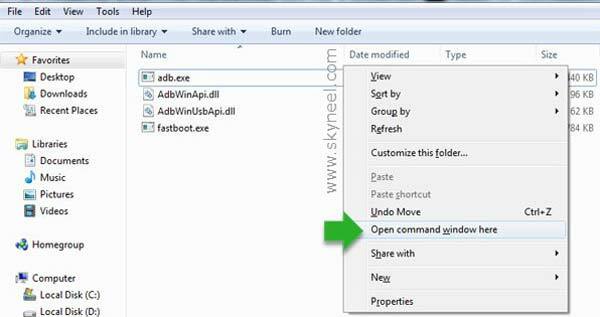 Now press and hold shift key in the keyboard and right click on extracted Fast boot tool folder and select “Open command window here”. See in this image. Step 2: Now connect your Yu Yureka Smartphone with PC via USB cable and type adb reboot bootloader to boot your phone in the bootloader or fastboot mode. (if this CMD command is not work for reboot bootloader or fastboot mode, then switch off your Yu Yureka and press volume up and power button. You will get a vibration and your device will boot in recovery mode, then you select Reboot to Bootloader. Now your device will enter Fastboot mode). When your phone in the bootloader or fastboot mode, then you type fastboot devices in the command window then press enter key. Now your device reboot and it will take some time on boot logo and updating your apps., so don’t worry. Enjoy Yu Open OS and Android 6.0.1 Marshmallow. After Install Official Marshmallow Yu OS for Yu Yureka, you can root your phone because root allows you to use a maximum of your phone without any restrictions. After root you will install custom apps, Rom and custom setting in your phone. But first read Root Advantage and Disadvantage by this article. I hope you like this Install Official Marshmallow Yu OS for Yu Yureka installation guide from which you will be able to easily Install Official Marshmallow Yu OS for Yu Yureka without any extra efforts. If feel any problem in this guide then please use comment box. Thanks to all. Hi Kiran, Google Crdroid Rom for your phone and install it. I already have lineage OS 7.1.2. I have some issues. I plan to install yu open os marshmallow. How can I do it using TWRP? Do I need GAPPS ? installed on Android 4.4.4 on yureka plus and now it stuck on Yu logo. after last method I tried reboot but it says low battery and Yu logo appears only. please help. I Have already Prepared a guide to install Stock Android 4.4.4 kitkat for Yu Yureka /Yureka plus. You can read it and resolve your problem. you have to repeat flashing process again. do we need a unlocked bootloader for this ??? “Step 3: Now type all command one by one in the command window then press enter key” at this step , do we have to press enter after each command ??? like type command press enter ….type command press enter ??? sorry i m new to all this so a little worried , i hope you will reply soon…..thanx in advance. Hi Kanak follow these steps you can automatically unlocked bootloader by the fastboot command. all steps are correct. Can I use this rom to flash my yu yureka plus. I have followed all the steps you have mentioned and i was able to update my Yureka mobile to Marshmallow. After updating to Marshmallow, Often my phone is restarting for no reason. Kindly help me in this regard. I tried formatting the cache memory, but i am not able to get into that mode also. Please guide me on this. Hi, i followed all the steps (My devices was on fastboot mode as i was getting device not found when used adb reboot bootloader but frm 2nd step it went well) and Yu OS got installed also and restarted booted up i was able to use it for 1 day. later phone got off due to battery low and from then im not able to start as it switches on and after some time it says android is starting and optimizing app etc and later it go back to initial boot screen every time. can you please help me how to fix this? Is this a cyanogen ROM or any other custom rom? Hi Vishnu This is YU OS based on Stock Android. Is it necessary to back up data before flashing cm13, bcoz i dont see anything like you have mentioned on the guide to create back up. Sir is it official rom or not ?? this is a not big problem i provide a guide to install TWRP and root YU OS for Yureka/Yureka Plus early soon.